“When you learn to code, you start thinking about processes in the world,” says Mitchell Resnick, the Massachusetts Institute of Technology professor heading up the effort to build the child-friendly programming language Scratch. Scratch has 6.2 million registered users and is accessible to children as young as five. Whether it’s understanding how complicated systems like economies work or tackling a problem in a stepwise fashion, coding is uniquely suited to training children not just how to solve problems, but also how to express themselves, says Mr. Resnick. Not every child who learns to write will become a novelist, nor everyone who learns algebra a mathematician, yet we treat both as foundational skills that all children should learn. Coding is the same, say educators like Messrs. Partovi and Mr. Resnick, who are pushing for it to be available to every child in America. It doesn’t hurt their cause that the Bureau of Labor Statistics projects that there will be one million unfilled jobs for programmers in the U.S. by 2020. And that may be an underestimate, says Mr. Partovi. He adds that the more software and hardware humans create, the more jobs in software there are, as new platforms like smartphones and drones spawn their own software ecosystems. I’d go further than that: Understanding that in the future no profession is untouched by machines means admitting that coding is part of the liberal arts, and therefore a core skill every child must possess. After all the original definition of “liberal arts” meant the body of knowledge required to participate in civic life, and included what was then known of astronomy and mathematics. Educators who are taking professional training to learn how to incorporate coding into their lesson plans include not only teachers of math and technology, but also teachers of English, says Mr. Partovi. Coding is, in a way, just another form of writing, albeit one aimed at creating stories that are interactive and dynamic, says Mr. Resnick. Public schools remain slow to catch up. The majority, including Donovan’s school, don’t offer classes in coding. Mr. Partovi says that’s the biggest obstacle to progress. 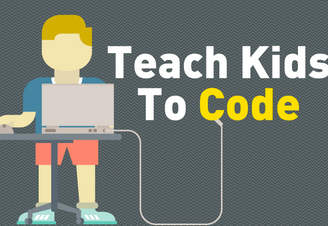 But for parents who aren’t waiting around, the options for teaching children how to code at home are growing. Bryson Payne, author of “Teach Your Kids to Code,” started with his own boys when one was two and the other four. He compares his approach to the Suzuki method of teaching young children violin, in which parents learn alongside their kids. Tablets are a natural vehicle for learning even for children who can’t yet read. The devices don’t require kids to first learn to use a mouse and keyboard, which can be tricky. Young kids easily absorb the lessons in programming games like “Lightbot,” saysGretchen LeGrande, head of Code in the Schools, a nonprofit group that targets girls and minorities. Everyone I interviewed observed that the best way to reach young children was to get them to create games, or to treat learning exercises as a form of play. Ms. LeGrande teaches kids concepts of binary code using nothing but a modified deck of cards, and the community of children registered with the Scratch language swap animations, code and stories in a gigantic online bazaar of imaginative play. Games based on popular children’s books are a staple. Codestudio, the online education program offered by Code.org, already reaches 1 in 10 grade-school students in the U.S., says Mr. Partovi. Of those students, 43% are female, and 47% are African-American or Hispanic. If even 1% of the middle schoolers enrolled in Codestudio eventually major in computer science, it would more than triple the number of women graduating in the field, says Mr. Partovi. Donovan, meanwhile, has no idea that he is the embodiment of an epochal shift in how his peers are educated. He is too busy learning level design, art direction and even retailing. That’s because “Gunman Taco Truck” already has a line of T-shirts.